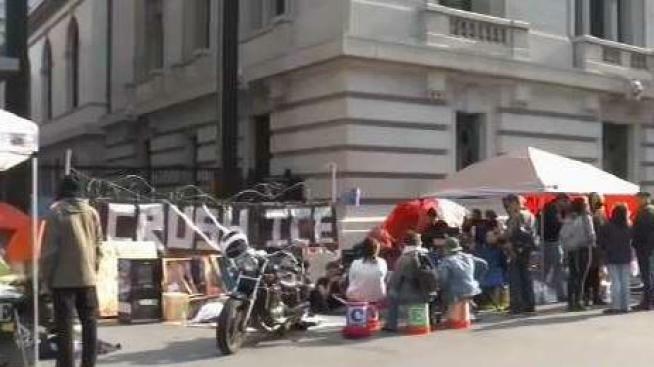 Protesters calling for the abolition of ICE remained in front of San Francisco's U.S. Immigration and Customs Enforcement Field Office on Wednesday, and they've shown no sign of leaving. The office was closed Wednesday for the Fourth of July holiday and is expected to reopen at 9 a.m. Thursday. 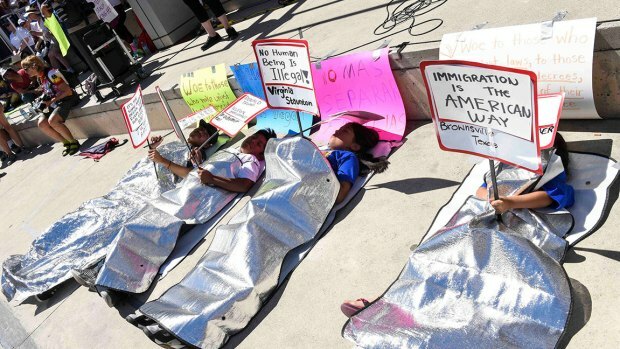 A group of demonstrators, some of whom showed up Monday, were camped outside the immigration office on Sansome and Washington Street, hoping to make their voice heard on issues beyond the separation of children from their parents at the U.S.-Mexico border. The tents have since expanded all along Washington Street into an actual encampment. It’s under federal jurisdiction, prompting the question: How long can this go on? Patricia Gorky, of the Party for Socialism and Liberation, indicated as long as it takes. "So what we’re calling for is the establishment of a just society," she said. "For abolishing ICE, for mass reparations to immigrants and for full rights to all immigrants." Gorky said the party doesn’t speak for everyone. In fact, many at the demonstration bristled at the idea anyone speaks for the majority. Organizers with Occupy SF huddled for hours debating a message before telling reporters they’re not "beholden" to the media or anyone else. Liana Chavarin said she wondered how any person could just stand by and watch as immigrant families suffer. "What I’m doing is I’m using my privilege, my power, to speak for those who can’t afford that,' said Chavarin, who attended the protest with her 7-year-old son. "I can afford to get arrested; I can afford to pay bail." Juan Pietro, one of the organizers with California Immigrant Youth Justice Alliance, told Bay Resistance that abolition means disbanding "detention centers and free all of our community members. You allow them the right to remain in this country outside of detention." In a statement, ICE says it "fully respects the rights of all people to voice their opinion without interference." "ICE remains committed to immigration enforcement consistent with federal law and agency policy," the statement continued. 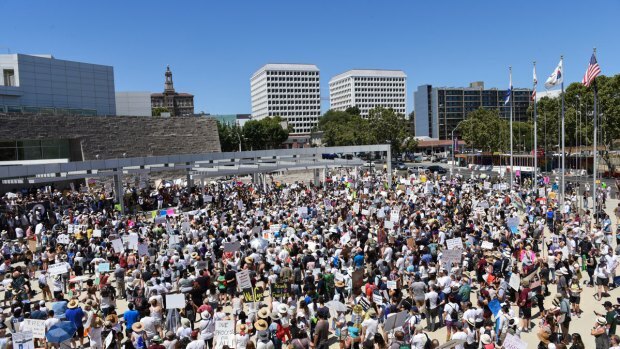 The call to abolish ICE has grown in recent days and the protest outside the San Francisco office comes after Saturday's hundreds of nationwide marches to protest against the current immigration policies. American flags waved and upbeat music played in front of San Francisco City Hall as thousands of people rallied to speak out against the separation of children from their parents at the U.S.-Mexico border. Christie Smith reports.